O.K. Having lost most of the readers here because I strayed away from knitting into embroidery, I now digress even further for a day. It’s no secret that The Resident Male and I met in the Society for Creative Anachronism (SCA), lo these many aeons ago. We were pretty active during our college and post college years, until other priorities, careers, homes, and eventually offspring crowded in on our lives. We still maintain a peripheral presence in the Barony of Carolingia (the Boston area group) because many of our oldest and dearest friends remain active. The few folk here who are SCA veterans and who went to Pennsic Wars past may recognize it. Our good friend Marian of Edwinstowe (now of blessed memory) had it hanging on the dayboard in her Sated Tyger Inn, and later in her Battlefield Bakery. Both were well-loved Pennsic-based food selling establishments she ran with friends and family for many years. We had largely disappeared from Pennsic by the time the Tyger had made the move from private subscription/cooperative cooking group to open-to-all eatery. But now comes the story. What’s with the carrots? Upon returning from oblivion about 10 years ago, and showing up to an event with a feast, we ran into comments like “You’re THAT Fernando,” and “Too many carrots for you?” The “THAT Fernando” comment we sort of understood. Duke Vissevald is a close family friend, and we were sure that his collection of stories included ones of Fernando, featuring a greater or lesser balance between entertainment value and veracity. But the carrot thing was a total mystery. More memory wracking was in order. Here’s what we’ve figured out must have happened. On the day of the feast that included the stew, I was running the front of the house, and Fernando was commanding the kitchen. Several people were helping, among them Embla Willsdottir, a good friend, who had mutual/reciprocal lampooning rights with Fernando, dating back to the dawn of time. I’m sure he commanded her to cut up the carrots for the stew, and in all probability gave annoyingly exact specifications for the task. She did it and set them aside, but when the stew came together the carrots were forgotten by all. At serving time, Embla probably chided Fernando about forgetting the carrots. I can envision her there, behind an apron, hand on one hip, waggling a forlorn carrot in his face. And I can predict his larger-than-life response. It probably ran something like “Carrots??? I need to nose up no miserable roots. I disdain them, and will not permit them to sully this stew. Take your tuber, cease this carroty caterwauling, and be off with you!” All accompanied by a well brandished spoon, and in a voice that would carry from kitchen to hall (and all in good fun). So the stew went out with no carrots; an easy to make and satisfying group dish gained a following; and an anti-vegetable reputation was born. 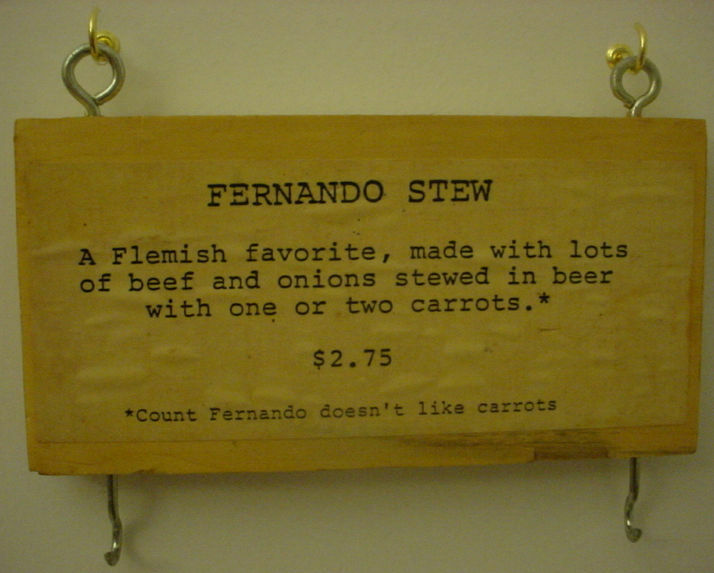 Now people all over the Known World know that Fernando hates carrots. Or so they think. In any case, Marian’s Fernando Stew sign has made its way to us. We have hung it in our kitchen with pride and fond remembrance. Ah, another person who has a Fernando! Mine is in the Middle, and he was the one a number of years back that charged the East line by himself, and was ransomed for Guinness. Lovely story and so nice to have a rememberance of days past.